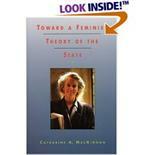 Review: Looking at the female and male halves of the world equally transforms everything--and Toward a Feminist Theory of the State makes that clear with scholarship, courage, and wit. By exposing and correcting the patriarchal values underlying nationalism and justice, Catharine MacKinnon causes an earthquake of thinking that rearranges every part of our intellectual landscape. This book is a "must read."